Way back when, Arctic Cat took its 1M and created its first mountain specific King Cat, a 153. It also had its 1M line 141 and a few limited-build 136s. As a young journalist on a mountain snowmobile evaluation, a rider from northern Utah joined our test crowd on a 136 1M. He had stuffed the tallest aftermarket track that money could buy under the tunnel and changed out the track drivers to a smaller diameter set to allow the track’s tall lugs to clear the front heat exchanger. The track was a tall, at the time, 2.25 inches. The rider was my same age in 2000; his 1M was also a model year 2000. I ribbed him about having a short track amongst all the 140- and 150-something mountain snowmobiles. He basically said, “Wait and see.” I did not have to wait long to see how well he and that 136 danced on the mountains near Preston, Idaho. He was masterful at tree running before tree running was cool. His 1M was like a cattle whip; snapping around Lodge Pole Pine trees on every hillside in a crazy way, so it seemed at the time. This story is not about the 136 1M from 18 years ago, but about two current day 146 deep-powder players that are whips in our hands. We are talking about the 2018 Ski-Doo 850 Summit SP 146 and Freeride 146. In its all-black colors, the 146 SP looks like a Summit X, and it moves along the mountain slopes like an X. But, as a 146, it is nimble, making it the quickest Gen4 REV mountain chassis. In the mountain snowmobiling world, steep-n-deep is the game and the players are 153 and longer snowmobiles. Who’d think a 146 would be a deep-powder player? Ski-Doo did. With the Gen4 Summit and Freeride sporting a 16-inch wide track, these 146s have a footprint of 2,336 square inches. That is plenty for Rocky Mountain aerobatics. Consider Arctic Cat’s M8000 153 or Polaris’ Pro-RMK 155, with 15-inch wide tracks; the first has a footprint of 2,295 and the latter 2,395 square inches. The 146 Summit SP and Freeride nearly match the 153 and 155 in square inches, and for the 146s, this is a nimbleness advantage, especially the SP. 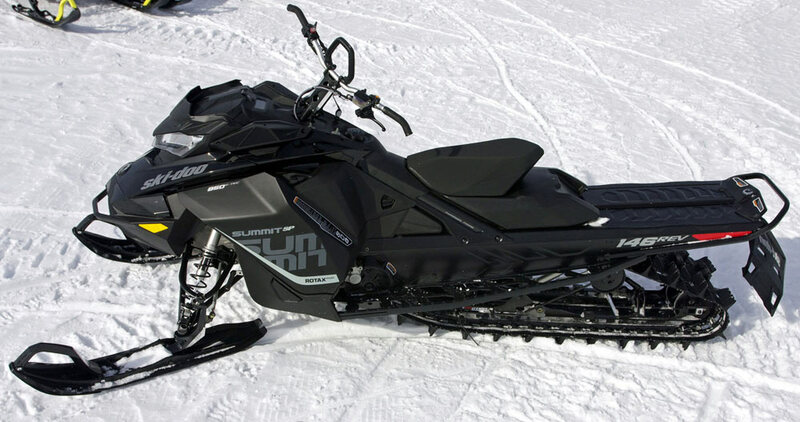 We have told you about the Gen4 REV Summit SP and Freeride being lively and quick-chassis snowmobiles. 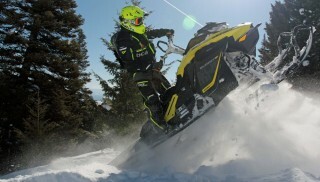 This, the fourth-generation Ski-Doo REV mountain chassis, is a fast-acting and obedient chassis – to the Nth degree. If you want a snowmobile that is easy on you as you approach your AARP years, or is as nimble as Jack when he jumps over burning candlesticks, then the 146 Summit SP and 146 Freeride are your snowmobiles. The 146 Freeride has piggyback reservoir KYB shocks and a wider ski-stance than the 146 Summit SP. This backcountry player, has some crossover artist in it as well. By way of added information, and an admittance to an editorial mistake, we wrote in our feature on the 2018 Ski-Doo Gen4 Renegade Backcountry X, that Ski-Doo has a 146 Summit X. Ski-Doo does not – and did not – offer a Spring-buy Summit X 146. The reason why this inked out into our story is on a particular test day, we had several Summit models at our disposal, including Xs and a lone 146 Summit SP. The 146 SP’s black graphics package is similar to the all-black Summit X, and the 146 Summit SP worked so hard at pleasing its driver, we thought it was an X, though “SP” was clearly visible on its hood. 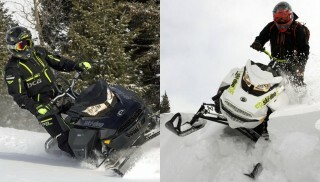 The 850 Summit SP is such a good model from Ski-Doo it is hard to decipher much difference between the X and SP. In short, though no Summit X 146 is offered, the SP and Freeride are highly capable mountain bronc busters, with one being more crossover-like than the other. Be careful in assuming a 146 is purely a crossover snowmobile. It is true the 140-something length snowmobile is the beginning crossover length. But these two 146 honchos from Ski-Doo are deep-powder masters; thanks to the PowderMax II track with 2.5-inch paddles and FlexEdge technology. 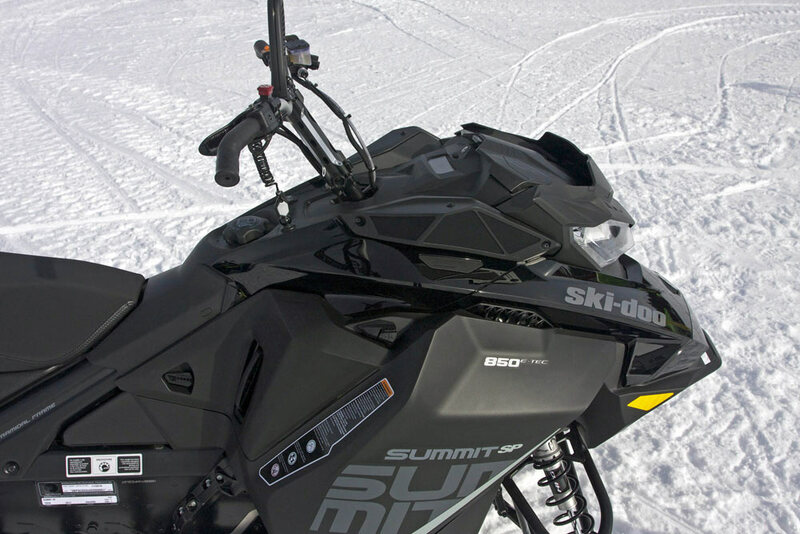 The nimble and narrow Summit SP 146 is a serious mountain snowmobile. Its short track length does not discount how well it behaves on powdery slopes. If you are itching from some Midwest ditch banging, then these two 146s are capable of scratching your ditch itch, especially the Freeride. Just so you have the know to go, Ski-Doo’s PowderMax Lite track, be it a 2.5 inch or 3.0 inch, is reserved for the 154s, 165s SPs and Freerides, and the 174 SP. Don’t stress over this, the PowderMax II track with 2.5-inch paddles can move snow. Yes, this track is not as light as the PowderMax Lite, but nonetheless, with its FlexEdge technology, it is a formidable track. Let’s discuss for a moment the crossover concept. It is becoming well known the Midwest and Eastern snowmobiler likes to travel to the West to ride Canadian and U.S. Rocky Mountain powder. If I were Midwest-based rider and not deep snow country based, I would head West and plow some pow. One snowmobile I’d highly consider is the 2018 Ski-Doo 850 Summit SP 146 or Freeride 146. For budget sakes, the SP makes sense, but if suspension tuning and all-things stout are in your motor head DNA, then the Freeride, with its crossover breeding, is the 146 deep-powder player to go with. Is the 146 Summit SP or Freeride competitive against Ski-Doo’s 154 Summit SP and Freeride? Yes and no. No, in that it will have less track surface area on the snow, and with its shorter-height paddles, 2.5-inches versus 3.0-inches, and slightly heavier track, it will have a slight flotation and bite disadvantage. Dropping off a cornice is the Freeride’s world. 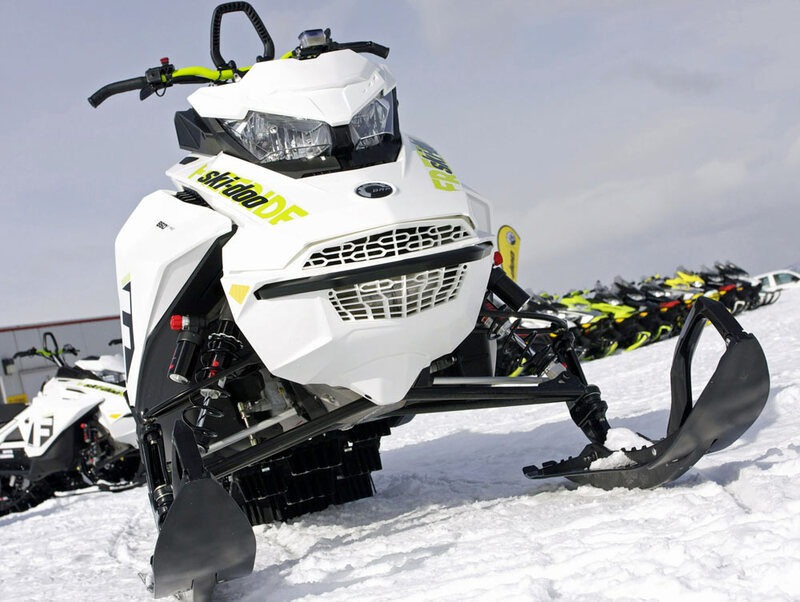 This mountain snowmobile blends the very best of Ski-Doo’s deep-powder and crossover mindset to give its owner a hybrid that is almost unmatched. Yet, if you want to be a whip-it huckster where you are a master at tight turns, and a slave to no mountain slope, then the 146 Summit SP and companion Freeride will give you the cash to buy out the longer track snowmobiles. Now, don’t scoop up the impression we feel the 154 Summit SP and Freeride are cumbersome, they are not. In a nanosecond world, the 146’s chassis is one nanosecond quicker than 154s. After all this discussion, what then do we feel is the difference between the two 146s? The answer is in shock package and ski width. The SP comes with Ski-Doo’s HPG shocks – High Pressure Gas – at all impact points: ski, front rail and rear rail. The Freeride on the other hand, is equipped with KYB Pro 36 R Easy-Adjust at the skis (“R” for remote or external reservoir), and KYB Pro 40 Easy-Adjust as the front rail and rear rail shock. As mentioned, ski stance between the two is different – this is where at the beginning we mention one of these 146s has a crossover purpose. The SP is all set for making cuts across a steep slope on the deepest of deep powder; its stance is an adjustable 35.7 or 37.4 inches. The Freeride 146, according to Ski-Doo’s literature is “Optimized for crossover usage, two ski stance positions dial in handling: 40.1 or 38.4 inches.” Here, Ski-Doo admits its Freeride 146 has crossover blood coursing through its frame. Like all Gen4 850 Summit SPs ahead of the 146 in length, the 146 SP has all Summit mountain amenities at the cockpit area. 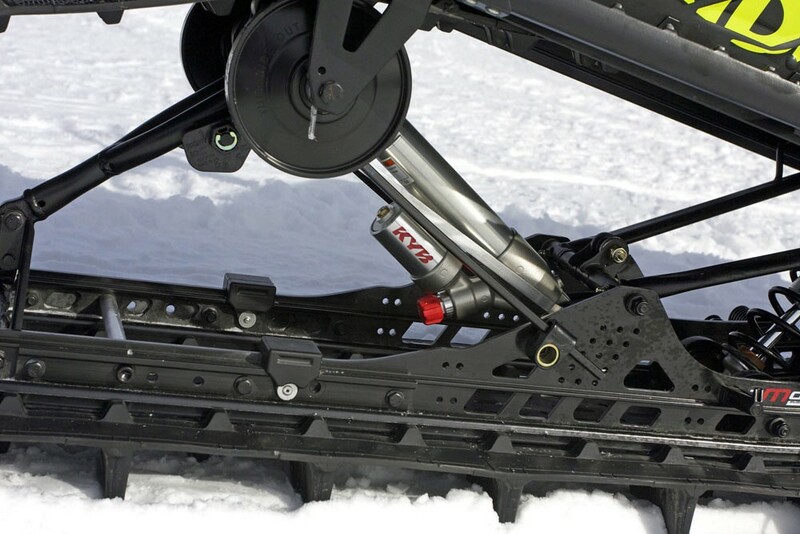 Both snowmobiles have front suspension RAS-3 and tMotion rear suspension. They are equipped with pDrive drive clutch and QRS driven clutch. Power comes from Ski-Doo’s all-about-the-grunt 850 Twin cylinder two-stroke with electronic direct injection (EDI) and booster injectors. These boost injectors fog the motor with added fuel when the motor calls up momma for more fuel. Because these are deep-powder snowmobiles from Ski-Doo, dealers who order these can opt-in SHOT – Start Hot; the obvious best choice. Why would anyone – any dealer – order a Summit or Freeride without the electronic starter is beyond belief? We doubt any dealer did, but we may be surprised. 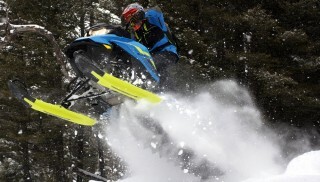 Ski-Doo has its crossover snowmobile, the Renegade Backcountry X, which we wrote about in late Spring. Ski-Doo touts this as a best of both worlds 50/50 crossover; with the PowderMax track, which has two-inch tall paddles, it comes close. For us though, we like a short track mountain snowmobile to do our trail bidding, and of the two 146s the Freeride is the crossover we would take, though it is, we surmise, 75% powder hound and 25% trail hound. For us, if we owned the Freeride 146, we’d run the hot rod in its narrowest ski-stance setting, dial down some shock compression, and let the Freeride 146 float atop the powder. Then, on the trail for a weekend of crossover riding, we’d set the stance to its widest, throw some pressure to the front shocks and hang out in crossover land. The 146 Freeride has premium KYB shocks at all impact points. 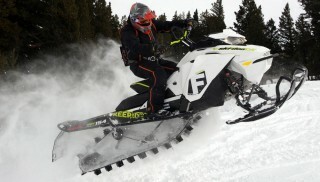 The Freeride 146 is a premium Spring-buy only mountain snowmobile from Ski-Doo. 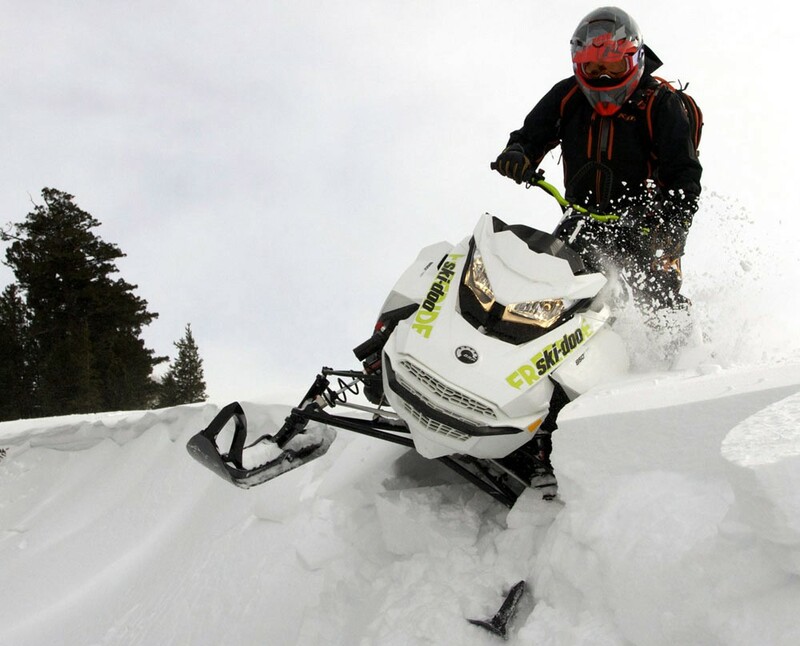 For the 2018 Ski-Doo 850 Summit SP 146, we’d keep it in its narrowest setting all day long. But like the Freeride, if the SP takes a week off from Rocky Mountain scavenging to a week of northern Minnesota clubhouse hopping then kicking out its stance to its widest makes sense. Does it not? We give our bet the Summit SP 146 is 80% powder and 20% crossover. 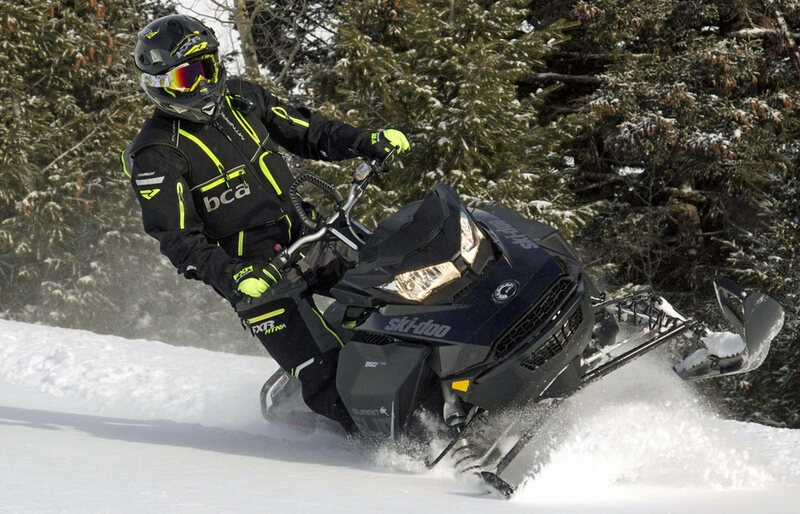 All-in-all, we give credit to Ski-Doo for offering its premium freestyle and backcountry boondocking snowmobile to the public as a 146, that is the Gen4 850 Freeride. Likewise, we support too Ski-Doo’s mission to carry its Gen4 850 Summit badge to the SP by giving the public an in-season 146, the Summit SP. These 146s deliver good powder play while being nimble on the trails and in the meadows for those who have an itch for crossover play. Of the two 146s, which would we take? Probably the SP, due to its lower price and that we are mountain riders residing in Idaho and Utah. However, we are fond of the Freeride; it is a “Wow,” snowmobile. Suggested MSRP for the 146 Summit SP is US$12,899 (with SHOT) and US$14,099 for the Freeride 146.